Skin pigmentation is the uneven coloration of skin. It comes in two varieties, hyperpigmentation, in which the melanin production is elevated, and hypopigmentation, in which the melanin production is lowered. If you live in or near Toronto, Doctors at Acne Clinic can help you get rid of this condition through a variety of treatments. Skin pigmentation has a variety of causes that are quite common. One of these causes is emotional stress. Because stress affects the body’s production of melanin, pigmentation is a common result. Hyperpigmentation is often caused by overexposure to heat, including sunlight. This is why many people develop the condition over the summer. You can reduce the chances of pigmentation during the summer months by wearing sunscreen and limiting the amount of time you spend exposed to sunlight. Injuries are also common causes of pigmentation. Even after cuts and scrapes heal, there can be slight inflammation. While the inflammation may disappear over time, the area that was inflamed may develop pigmentation at a later time. A variety of types of medication are also known to cause pigmentation. Typically, you can find this listed as a side effect in the warming labels when you get them. Finally, certain diseases, such as cyanosis and jaundice, are frequent causes of the condition. These conditions can be especially noticeable due to the colors that they can cause. Jaundice, for example, causes skin to appear yellowish. Cyanosis, which involves insufficient circulation of oxygen in the blood, may cause skin to appear blue. 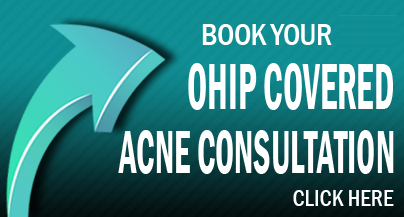 Regardless of the origins of your pigmentation, the right acne doctor can help you to get rid of the condition. Doctors at Acne Clinic can speak with you about what may have caused your condition and create a treatment plan to get your skin looking and feeling healthy once again. Call today to set up an appointment in the Toronto area.